Neil McCann wants another chance to prove himself as a boss despite admitting “losing the rag” with Dundee players unable to handle his demands. The 44-year-old former Scotland winger was sacked in October after his side took three points from their first eight games this season. Former Dundee players Scott Bain and Kevin Holt have criticised his style. McCann, who began his playing career at Dens Park, took charge of Dundee on an interim basis near the end of the 2016-17 season. After guiding his side clear of relegation trouble, he initially announced he was returning to his role as a TV pundit before reversing that decision three days later to take over permanently. His side finished ninth last season and struggled at the start of the new campaign only to lift themselves off the bottom of the Scottish Premiership under new manager Jim McIntyre. Goalkeeper Scott Bain left Dundee for loan spells with Hibernian and Celtic before a permanent move to the Scottish champions after a dispute with McCann. Midfielder Holt, now with Pafos in Cyprus, and defender Julen Etxabeguren, now of Real Union, have both been quoted as criticising McCann’s behaviour. “There were no square-goes offered,” McCann said. “There were certainly passions running high after games. “Coming in on a Monday, there were no apologies handed out. There was a reasoning of why I lost my temper after the game. 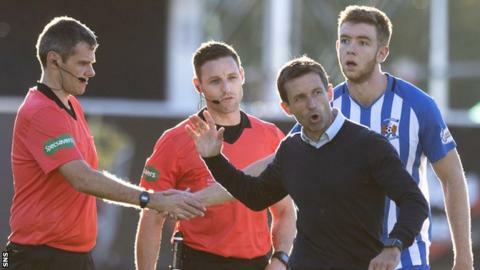 McCann also had a touchline row with St Johnstone goalkeeper Zander Clark and manager Tommy Wright immediately after a 4-0 defeat in March. Asked if he regretted the incident, McCann said: “No. Why should I? I never touched him. “I’m a passionate man. When a 6ft 5in goalkeeper grabs you behind the neck, I’m not just going to walk away. McCann pointed out that he had shaken hands with both Clark and Wright at a following game. Days before McCann was sacked, former Hearts manager Jim Jefferies, who was in a similar position with League Two club Edinburgh City, was approached to take a director of football role at Dundee. McCann said he “didn’t need” help but thought it was a good opportunity to decrease his own workload if the club was offering to pay another wage. “I was so dominant in terms of dealing with everything – and I mean everything, pick-ups at airports, talking to agents, talking to players, making sure they’re okay, scouting,” he said. McCann insists he was surprised to be sacked despite his side sitting bottom of the table. “I was aware I was under an element of pressure, but certain conversations had between myself and the board were suggestive that I wasn’t under immediate pressure,” he said. Having won 2-0 away to Hamilton, Dundee then lost 2-1 at home to Kilmarnock, but the Dens Park board waited until the end of the international break before making their decision to seek a new manager. “If you look at the two games, we coughed up five chances – maybe only two or three of those were clear,” he said. “So, defensively, I think we had addressed a few things. “A contentious decision cost us a penalty, which was put away, and then we lose the game, but then you go into the international break and we all know the culling season is generally about that time, but it didn’t come. McCann thought social media now puts extra pressure on football boards. McCann pointed out his team building had been hampered by injuries to key players like Roarie Deacon, Josh Meekings, Paul McGowan and Glen Kamara, while new signing Kenny Miller was suspended immediately after joining the club. However, he insisted he would not “change my philosophy” and that he was sacked just as he was beginning to turn Dundee’s possession football into a greater goal threat. Asked if he was wanted another go at being a manager rather than returning to being a full-time pundit, McCann said: “Absolutely. “I love management. I love coaching the boys. I love trying to make teams better.